I'm working my way through my list of books I want to read on Pinterest. 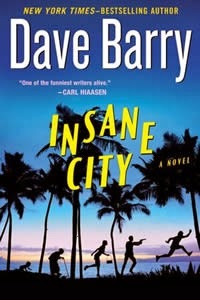 The latest book I've read is Insane City by Dave Barry. I'm a big fan of Dave Barry's work. He certainly has a gift for the absurd. In his humorous Miami Herald newspaper column, he writes about absurd current events. His non-fiction books are laugh-out loud funny. His fiction writing is just as absurd and just as hilarious. In Insane City, Seth is about to be married. Seth and his friends arrive in Miami, Florida for the wedding and his friends are determined to show him a good time. From the airport, they get a bad cab driver who takes them to the wrong hotel. They end up at a nightclub, drink too much and lose their luggage. From there, things quickly go from bad to worse. Seth soon finds himself in a crazy weekend that involves a stripper, illegal immigrants, drugs, a police chase, a pirate boat, an orangutan, and a lost wedding ring. There are some great characters in this story. Although Seth's parents have a small role in the book, they are two of my favorite and most memorable characters! The book is very plot driven and it moves along quickly. You can't wait to find out what crazy, bizarre thing will happen next, how Seth will ever get out of an ever worsening situation, and whether he'll make it to his own wedding. Seth's character is a really good guy and although insanity is continually surrounding him, he keeps his cool. He often feels a sense of responsibility for many of the events that happen in the story and is convinced there is a way to solve all of the problems that arise during the weekend. I thought this was a very funny and humorous novel. I enjoyed reading it and would recommend it, but with the warning that it's definitely an adult novel.